I got an email recently from a person at the Brooklyn Zen Center who objected to some of the stuff I said in my article about Collective Karma. She said, “I understand your point about collective karma and we do not discuss it in such simplistic cause and effect terms.” That’s good to hear. But she also said, “it became clear that Buddhism was having a difficult time across race lines as the leadership always appears male and white.” I’ve heard other people say things like this a lot lately and it doesn’t make any sense to me. Buddhism has been around for about 2500 years. It has only been practiced by white people in any significant numbers for about 50 years. For the first 2,450 years of its existence, there were virtually no white people involved in Buddhism, either as teachers or practitioners. And, in fact, white people are still a teeny, tiny minority when it comes to Buddhism worldwide. Even in the USA, most people who identify as Buddhists are not white. If it took 2,450 years for white people to begin to catch on to Buddhism, it doesn’t seem unreasonable to me that it might take another few decades for people of other races to start getting into it in a big way. I started studying Buddhism around 1983 or ’84 in Ohio. My teacher was of Irish ancestry. Even in the early 80’s a white Buddhist teacher was an anomaly. Tim was one of the first generation of non-Asian Buddhist teachers. His teachers were Japanese. When he started studying Buddhism in the 1960’s there were no non-Asian Buddhist teachers at all. White folks first started getting interested in Zen Buddhism in any significant numbers in San Francisco in the 1960’s. And when I say “significant numbers” those numbers were still very small then. There were, perhaps, less than a thousand non-Asian Zen Buddhists in America by the end of the 1960’s. The numbers for other forms of Buddhism were probably even smaller. In 1959 Shunryu Suzuki was installed as the head of a Zen temple in San Francisco that served the Japanese immigrant community. When a few non-Japanese people started coming to that temple to do zazen, they were looked upon by the rest of the congregation as kind of strange and perhaps even a little suspicious. They were definitely the odd ones out. Suzuki himself was also an oddball in that he accepted these students. Most other Buddhist teachers in the US were not nearly as welcoming. Suzuki’s temple was arguably the first Buddhist center in America to welcome anyone other than ethnically Asian folks. It’s only been since around the mid-1970’s that there were any Zen Buddhist teachers in the US or Europe who were not first generation Asian immigrants. Other forms of Buddhism were about the same in that regard in those countries. 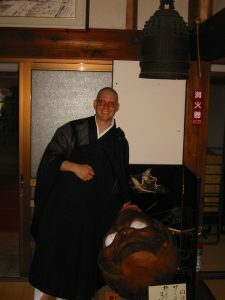 After practicing Zen in Ohio for about a decade, I moved to Japan and started practicing there in 1993. My Japanese friends thought that was pretty funny, especially when I had my head shaved for my ordination ceremony. Non-Japanese people with shaved heads and Buddhist robes were a bizarre sight to most Japanese people then, and are only slightly less weird looking to Japanese people today. We are still, in 2019, at the very earliest stages of Buddhism transitioning into the west. It doesn’t seem strange to me that at many of our temples and centers we see mostly people from the racial majority in these countries. My correspondent from Brooklyn lamented that, “for a person of color to trust the practice it became clear that it was a huge leap.” I’m sure it was a huge leap for the first generation of American Buddhists to trust their immigrant teachers, some of whom barely spoke English and were not used to American culture. Even now with many teachers who are native speakers of western languages, Buddhism still feels very exotic to most westerners, regardless of race. Perhaps some kind of leap of trust is a necessary part of the practice. This may have very little to do with race. My correspondent asked me, “What does your sangha look like? Do you reflect the LA population?” As a matter of fact, the Angel City Zen Center is fairly diverse in terms of superficial stuff like race and gender. Although this is not due to any real effort on anyone’s part. We normally get around 10-15 people at any of our zazen sittings. With numbers like that I’m just glad that anyone at all shows up. I don’t have the luxury of worrying about the racial demographics. I know it’s very trendy these days to fret endlessly about racial diversity. But I don’t think that ought to be a major concern for teachers of Zen Buddhism. Our first and most overriding concern ought to be trying to correctly transmit what we have learned from our Asian predecessors. If we get too involved in trying to create racially diverse sanghas there is a chance we might lose sight of what we are really there to practice. I also remember that Reverend Jim Jones, of Jonestown fame, was a huge proponent of trying to bring races together. Which indicates to me that an interest in racial harmony doesn’t, in and of itself, necessarily indicate that all is well with a given spiritual gathering place. Besides, when I go to another city and speak at a Zen center whose attendees are mostly white, I think maybe the other folks in the area are happy with their own churches, synagogues, mosques, and other spiritual centers. Or maybe they don’t care for religion at all. In any case, I’m not sure it would be nice for the Zen Buddhists to try to woo folks away from spiritual paths they’re already comfortable with. So, in the end, yeah, I’d be happy to see a few more Latinos, black folks, middle easterners and so forth at our events in LA. We already have some long term attendees from those demographics, but I wouldn’t mind seeing more. I don’t lose any sleep over it, though. I figure that one of these days we’ll start seeing more non-whites at Buddhist centers in the USA and Europe. I’m content to wait for that to happen naturally.